Josh Brown | Troy Daily News file photo Miami East’s Graham Shore (left) celebrates his state title with assistant coach Rich Randall and head coach Mark Rose (right). 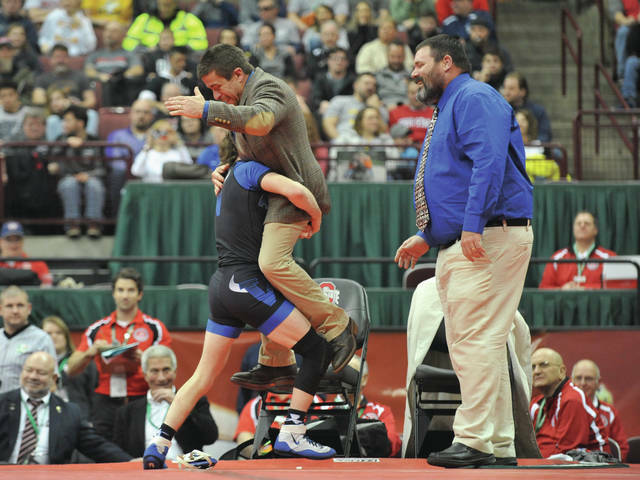 Josh Brown | Troy Daily News file photo Miami East assistant wrestling coach Rich Randall (left) and head coach Mark Rose (right) cheer on Graham Shore during his state championship match last winter. CASSTOWN — With every wrestling season, Mark Rose is proving Thomas Wolfe wrong. In his 1940 best-selling novel, “You Can’t Go Home Again,” Wolfe tells the fictional tale of author George Webber, who achieves success worldwide, but finds himself a pariah upon his return to his hometown of Libya Hill. Rose has found no such problems navigating his return home. Rose was a state placer for the Miami East wrestling team in the 1990s. Following his graduation from Miami East, he went on to earn Division II All-American honors while wrestling at Ashland University. Rose also played football for the Eagles. After graduating from Ashland, he would return home to become a teacher and coach at his alma mater. Since then, Rose and his staff have gone on to solidify an already-respected Miami East program as one of the toughest small-school programs in the state. All of that hard work by Rose and his staff helped produce one of the most successful seasons in school history, as the Vikings won their first sectional title since 1994, their first district title in school history and the best team finish at the state tournament in school history. For his efforts in leading the way for Miami East this season, Rose has been been named the Troy Daily News Boys Coach of the Year for the 2017-18 school year. The award is a tribute not only to Rose, but his coach staff of Rich Randall, Jason Sroufe and Stewart Strubler. Miami East dominant through the regular season last winter — often winning tournaments against much larger schools — then truly kicked things into high gear once the postseason arrived. At the Division III sectional tournament, Miami East racked up 244 points, enough for the Vikings’ first sectional title in nearly a quarter-century. Six Vikings won individual titles, 12 out of 12 wrestlers placed, 10 placed in the top four to earn a trip to districts and two placed in the top five to become district alternates. At the district tournament, three Miami East wrestlers won district titles, while another placed third, sending four wrestlers to the state tournament. A total of six wrestlers placed in the top six for the Vikings at the district meet. At the state tournament in Columbus, seniors Alex Isbrandt and Graham Shore both became four-time state placers; they were just the second and third wrestlers to accomplish that feat in school history. Isbrandt placed fourth while wrestling with an injured shoulder, while Shore become just the second wrestler in Miami East history to win a state title, joining three-time state champion Ryan Gambill. As a team, Miami East finished eighth, the highest finish in school history. Following the season, Rose was name Greater Miami Valley Wrestling Association Coach of the Year, while Randall was named GMVWA Assistant Coach of the Year. https://www.tdn-net.com/wp-content/uploads/sites/21/2018/07/web1_rose1.jpgJosh Brown | Troy Daily News file photo Miami East’s Graham Shore (left) celebrates his state title with assistant coach Rich Randall and head coach Mark Rose (right). https://www.tdn-net.com/wp-content/uploads/sites/21/2018/07/web1_rose2.jpgJosh Brown | Troy Daily News file photo Miami East assistant wrestling coach Rich Randall (left) and head coach Mark Rose (right) cheer on Graham Shore during his state championship match last winter.